GE Industrial Spec-Setter™ Type TG 3-Pole 4-Wire general-duty safety switch is rated at 400-Amps and 240-Volts at 50/60-Hz. It has power rating of 50 hp at 240-Volt AC for 3-Phase and 100 hp at 240-Volt AC for 3-Phase. Surface mountable switch features steel construction. It accommodates one 2-AWG - 600-KCMIL or two 1/0-AWG - 250-KCMIL copper/aluminum wire. 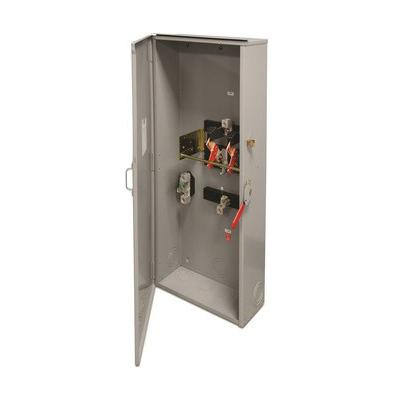 Fusible switch has lockable cover and handle that prevents unauthorized entry and use. It measures 49.4-Inch x 21.6-Inch x 8.7-Inch. Switch uses Class R cartridge fuse for providing protection to low-voltage electrical installation against short-circuit/overload current. It is perfect for commercial and industrial applications where safety, high-performance and continuity of service are essential. It has NEMA 1 rated indoor enclosure for safety. Switch is UL listed, CSA certified, GSA compliant and meets WS-865C Federal specification.